In the United States, veterinary diagnostic kits which are used to diagnose pathogens or a patient’s immune status are regulated as biologics by the United States Department of Agriculture – Animal and Plant Health Inspection Service (USDA-APHIS). Approval for these veterinary diagnostic kits are managed by the USDA’s Center for Veterinary Biologics (USDA-CVB). Examples of veterinary diagnostics are point-of-care diagnostics such as those to test for feline leukemia virus, canine parvovirus, canine heartworm, and other viruses, bacteria, parasites and veterinary pathogens. Veterinary reference laboratories are not necessarily subject to the same approval requirements as point-of-care diagnostic kits. More information can be found at the American Association of Laboratory Diagnosticians. Non-infectious disease diagnostic kits and equipment which can be used for analysis of hormones, immune function, and biomarkers. Molecular diagnostics kits such as PCR, or genetic analysis for specific hereditary diseases. Other testing reagents for use in histology (immuno-histochemistry, staining, etc.). More information concerning the requirements for licensing a veterinary diagnostic can be found at the USDA-APHIS website (click here). In order to obtain a Veterinary Product License for certain veterinary point-of-care diagnostics, there are specificity and sensitivity requirements. Examples of veterinary diagnostic kits include those for detection of Canine Parvovirus, Feline Leukemia Virus, and Canine Heartworm. Veterinary diagnostic kits are also used to determine immune status, such as evaluating failure of passive transfer. Veterinary biomarkers may not require a formal approval by the USDA-APHIS, including those conducted at a reference laboratory. 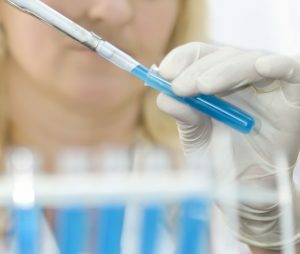 Examples of biomarkers may include hormone levels, chemistry panels, CBCs, vitamin and mineral levels, cancer biomarkers, serum electrophoresis, and other non-pathogen diagnostics.